Combine all the ingredient for the Guasacaca together in the jug of a blender and blitz until smooth. Transfer to an airtight container until needed. Combine all the ingredients for the Chimichurri in the jug of a blender and blitz to a coarse consistency. Place in an airtight container and place in the fridge until needed. To cook the steaks, preheat the BBQ until it is very hot. Season the ribeye on both sides. Cook the steak, flipping every 15 seconds. 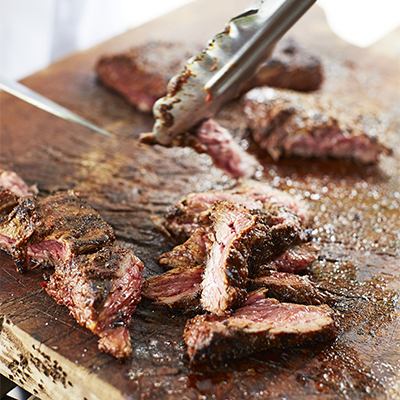 A 2cm steak will take about 2 minutes to reach medium-rare. Insert the probe into the thickest part of the flesh. The meat will need to be removed approximately 5 degrees before reaching the desired temperature as it will continue cooking after it’s removed from the heat. Place the meat on a cooling rack set over a tray and allow to rest for 5 minutes before slicing against the grain. Serve with the Guasacaca and Chimichurri.